A mother has become the first in the world to give birth to a second child after an ovary transplant operation, doctors in Denmark have revealed. Baby Lucca and sister Aviaja are among just nine children born through the procedure, where ovarian tissue is removed, frozen and transplanted. Their mother was robbed of her fertility by cancer treatment. Experts say the technique could help others facing treatment that might damage their ovaries. Aviaja, who was born in 2007, was conceived following IVF but Lucca, born in September 2008, was conceived naturally. 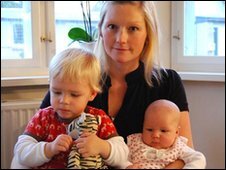 Their mother, Stinne Holm Bergholdt, aged 32, said it was a surprise to find out she was pregnant a second time because she thought she would need fertility treatment again. She said: "We had an appointment at the fertility outpatient clinic to talk about the possibility of a second baby, but it turned out that I was already pregnant - naturally. "It was a very nice surprise to find out that my body was now functioning normally and that we were having a baby without having to go through the fertility treatment. It was indeed a miracle!" Her doctor, Professor Claus Yding Andersen, said it was the first time in the world that a woman had had two children from separate pregnancies as a result of transplanting frozen/thawed ovarian tissue. He said the ovarian tissue was continuing to function more than four years after being transplanted back into her body. More tissue remains frozen in liquid nitrogen, and could remain functional for as long as 40 years, he added. He said: "These results support cryopreservation of ovarian tissue as a valid method of fertility preservation and should encourage the development of this technique as a clinical procedure for girls and young women facing treatment that could damage their ovaries." Dr Melanie Davies, a spokesperson for the Royal College of Obstetricians and Gynaecologists, said the results appeared encouraging but there had been a mere handful of successful cases so far. She said: "This is very encouraging news that a woman has succeeded in having two children from one fairly simple operative procedure and storing her ovarian tissue but it's early days." The case is reported in the medical journal, Human Reproduction. Mrs Bergholdt, who works at the University of Southern Denmark in Odense, is also an author of the paper.